A bug is a well known (yet not documented) bonus feature that is implemented in a software. Makes the software safer and more user friendly. There are several types of bugs, but only the best will lead up to the famous BSOD that is the high point of the day for every computer user. It is a common misconception that the software bug is some sort of accidental design flaw. The truth is all the best software (see Windows) has several major bugs carefully incorporated during the initial stages of product design. One of the greatest advantages of such good software practice is that it helps increase corporate profits by enhancing consumer satisfaction with so-called patches and bug-fixes. "Bug-fixes" is a term that relates to the replacement of old outdated bugs with far more efficient super-bugs to the pleasure of the dedicated customer (see Service Pack 2). A bug, in other contexts, is a butterfly with colorful wings or a kind of car, driven by girly men. You are not a girly man, are you? ARE YOU?? Bugs are also the mainstay of Martian diet recently introduced to Earth by Iron Chef Joe Rogaine. Martians eat bugs as a way of honoring their ancestors. The skill of preparing Martian cuisine as learned by terrestrial chefs is known as mixed martial arts. The Bugs themselves are aliens from a planet near Epsilon Eridani. Their culture and lifestyle is seen in the documentary Men In Black. The insects are an elite cadre of phsycophilic creations that exist in formations of reality spliced through time. Insects pre-date the time anyone even imagined their existence, so they're really old. Insects are commonly mistaken with their mortal enemies: the bugs. Personally, as an insect conspiracy theorist, I can't understand how you could get the two mixed-up. 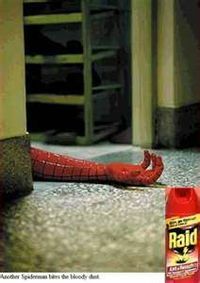 Every bugs worst nightmare including spider-mans. The insects have come a long way, there were once but seven legendary insects. They were the creators of the insect tribe and wrote the declaration of indisectependance by hand (or through insectotelekenesis). This meant that they could eat freely and peacefully, and they were now free to split apart from their lesser cousins, the bugs. At first the insects were bullied by other creations long long ago. The insects are very different from other tribes because, firstly, they feast on their babies (only one per month) due to the slow speed of the insects' growth. And secondly, they did not worship a created mythological being, because they were the first creations created not by a supernatural being, but independently. They have had phases of hierarchical organisation, especially in hives and anthills, but most of these ended suddenly, as with the abdication of Gnat King Cole. 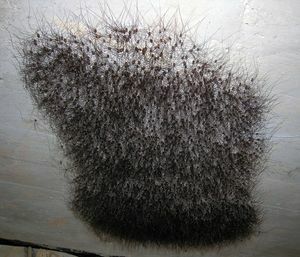 After the spider community invented what it called "the web", insects became so well-informed that they largely lost the desire for a recognised elite and the tiresome democratic processes required for any attempt at collective compromise solutions. Self-reliance thus became their credo. Way before time was even thought about, the very first insect, Shenolonious Tanoloniosphere created himself out of sheer boredom and an obsession to 'start something'. After shaping his body, he set to work on creating a more efficient way to think. He discovered after a long session at the library that he could craft a thinking computer in his very own head to make thinking portable and convenient. He named this construct the source generating sphincter. He began work at his workshop and crafted himself the source generating sphincter with the help of a handyman named Joe "Jankem" Oswald. Even though time had not yet been invented, handymen were plentiful. As soon as he placed the construct in his device slot, his brain set to work on creating ideas. The first of his ideas was to go on a hike and he discovered the trees. He soon decided he was bored again so he wanted to create something again. So to stimulate his brain he decided to read some awe-inspiring articles on wikipedia.org. The first thing he researched was himself, the insects' Ultimate Founder. And so he found himself, Shenolonious Tanoloniosphere. He was stoked. Off the top of his construct he conjured the idea to search "wheelboarding". He was fascinated by what he saw, a picture of a chinese boy riding a plank with wheels in Peking. This was amazing because Peking would not be formed for tens of billions of years. He immediately went to buy a wheelboard, which was also impressive because time didn't exist (so how could anyone sell wheelboards?). But as Shenolonious was the insects' Ultimate Founder, he created himself out of nothing, so im pretty sure he could manage to buy a skateboard.